Some Assassin’s Creed fans were upset about Ubisoft’s announcement that there would be no major Assassin’s Creed game this year, although at least the French company has made up for them this year with new episodes of the Assassin’s Creed Chronicles spin-off and the recently announced The Ezio Collection, a remastered bundle of the Assassin’s Creed games starring Ezio Auditore. And of course, there’s also the upcoming Assassin’s Creed move starring Michael Fassbender and Marion Cotillard, which will hit movie theatres this December. The movie features a new setting not yet seen in the Assassin’s Creed games (15th century Spain) and a new protagonist named Aguilar (and his modern day alter ego Callum Lynch). Judging by the trailers we’ve seen so far, it looks like this Assassin’s Creed movie will feature high production values, and it’s clear that Ubisoft, which is involved in the project through its Ubisoft Motion Pictures studio, is pulling out all the stops to make sure that the movie is as true as possible to the games. So will future Assassin’s Creed games draw from director Justin Kurzel’s movie, even if it does not turn out to be a commercial success? It is clear that Ubisoft is unlikely to abandon the Assassin’s Creed franchise given what a money maker it has been, and if the movie succeeds it’s very likely future games will draw inspiration from it. An example of this is the way the Animus is portrayed in the movie, as it looks way more spectacular than in the video game version, where it looked more like the sort of chair you might find in a dentist’s office, truth be told. The Animus, of course, is the nifty machine that allowed bartender Desmond to relive the memories of his ancestors (those of 15th century Italian hero Ezio Auditore in the Assassin’s Creed II video game). The Animus as seen in the movie’s trailer (compare to the video game version above). So it’s likely that the Animus in future Assassin’s Creed games will look more like the film version, especially considering that Ubisoft’s development team visited the movie set and did come away rather impressed… According to GamesRadar, a former head of Ubisoft Motion Pictures said that “the Assassin’s Creed team came on set and when they saw some stuff they were very impressed”. 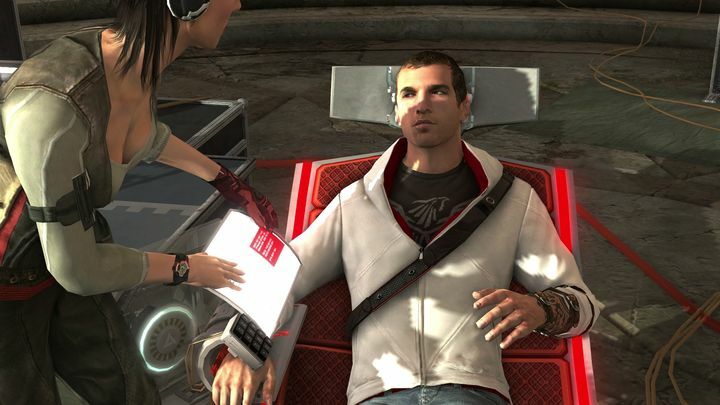 Also, referring to an interview in Total Film Magazine with the movie’s star Michael Fassbender, the actor said that initially the movie makers were going to make the Animus a “fluid tank, almost like a womb” but finally settled for the robotic claw seen in the trailer, and also hinted that it may appear in upcoming Assassin’s Creed games. “What the guys came up with is fantastic. Ubisoft are talking about putting it in their future games”, said the German-born actor.